Compartment Fire Behaviour Training (CFBT) has gained international recognition as the corner stone for building firefighting teams that are fully prepared to meet the dangers of modern structural firefighting.The 3D Hybrid CFBT System features a unique design that allows students to experience a highly realistic training environment in one simulator cell. These results in cost savings as well as reducing the space required on training sites. 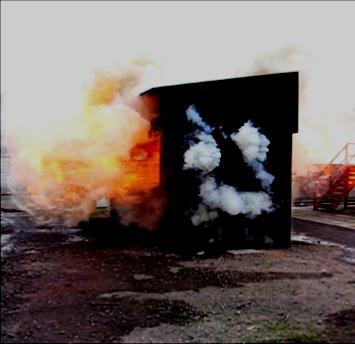 The concept of using shipping containers for compartment fire behavior training originated in Sweden in Sweden around 1980. Fire Engineers Krister Giselsson and Mats Rosander had been redefining the traditional approach to firefighting and were developing techniques that we based on scientific principles and the increasing use of synthetic petrochemical based materials in almost every part of the built environment. Gisselsson and Rosander had been burning old structures that were going to be demolished to conduct research and training. Stockholm Station Officer Ander Lauren worked with Rosander to make simple modifications to shipping containers to produce a training prop that could be reused for compartment fire behavior training. In 1985 the Swedish Rescue Services Agency (Raddnings Verkett) designed a system that consisted of 3 phases. The next step was to use a container with a raised combustion area. The training objective was to give the students an opportunity to witness the various stages of fire development in relative safety. The objective of raising the fire base was to raise the heat layer to keep the student cooler. The early design theory was based on an assumption that if the base of the fire was raised, then the hot gas layer is higher. In reality this is not possible as shortly after leaving the raised combustion area, the heated gas layer will form a thermal layer that is totally determined by the temperature and volume of the gases. 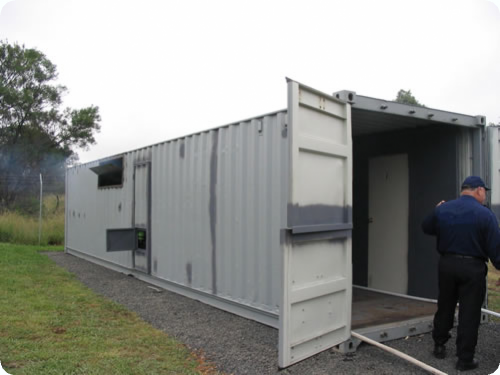 The 3 stage was to use a closed container with an entry door that would allow the students to practice reading the fire conditions before entry, use correct nozzle techniques to test and improve the environment before entry, and to allow them to practice making entry while controlling the fire gases. This used a straight 40’ container and is commonly referred to as the Attack Container. That early model has been extensively review and supported by improvements in the written support standards and learning material. After observing many different training cell designs and training approaches in Sweden and other locations around the world, Aus-Rescue designed a training cell that could be used to demonstrate the very basic elements in safety, as well as providing elements that could easily allow the “open’ cell to be transformed into a “closed” cell that could facilitate the logical progression into more advanced learning outcomes such as “reading fire”, “door entry” technique, 3D Water-fog techniques, fundamentals of tactical ventilation, and hoseline management. The development of a unique side ventilation system made it possible to operate the safety vent from the leading edge of the open system and from the front of the cell. When the hybrid cell is transformed to the “closed” (attack) mode, a 3rd vent operation point allows the instructor to set and control the ideal condition for door entry training. THINKING OUTSIDE THE BOX – TWO TRAINING PROPS IN ONE! The hybrid cell includes a facility to allow for a retractable foyer entry, which includes 2 standard entry doors. One opening inwards and other outwards. This facilitates door entry entry technique practice under realistic conditions. This allows for the teaching of all aspects of foundational CFBT and builds a strong foundation for safe and effective progression into tactical training. Lever operated controls allow for the Instructors to rapidly ventilate if required from either side of the foyer wall and externally. The hybrid is the most versatile CFBT system on the market. The design is based on international experience and is designed with safety and ease of use in mind. Ease of loading and set up is a major consideration for the end users. Advantages of the Hybrid Prop design. It is easy to load and clean out because it is at ground level. Boards can be carried directly into the cell from the 2.4 m wide front entrance. A wheel barrow can easily be taken to the back of the cell for cleanout. It is cheaper to construct and maintain. It can be used for a wide range of training objectives. The students at the back are able to see the fire changes that occur in the ceiling layer directly above the fire. A 600 mm baffle plate captures the gases at the combustion zone end. The students are on the observation side of the baffle plate. The instructor can allow flame rollover right to the baffle plate and can control it with the side vent and the application of water into the flames or smoke on accumulated on the combustion side. A safety door is located in the observation zone on the side of the container. This is held closed by a magnetic latch which can easily be opened by applying light pressure. There are no handles or latches to locate or turn. The student simply has to apply a light push and the door will open! A 600 mm by 1800 mm side louver vent is designed to allow for easy and reliable operation even in the hottest conditions. A pivot rod extends to the front of the container and 3 sets of strategically located levers allow for rapid operation from the front, just inside of the swing false wall and near the safety door. 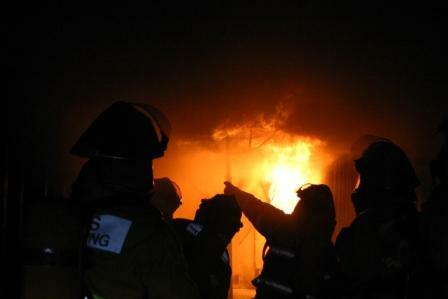 1.1 Describe the characteristic development and behaviour of a compartment fire. 1.2 Describe the combustion process within a compartment and the contribution made by different fuels to a fire’s growth and development. 1.3 Describe the contribution to fire development provided by elements of structure such as walls and ceilings. 1.4 Describe the characteristics and effects of flashover, and fire gas ignition conditions. 1.5 Experience the visual and physical conditions of a typical developing compartment fire. 1.6 Describe the effect of ventilation on the development of a compartment fire. 2.1 Recognise and interpret the development and behaviour of a compartment fire. 2.2 Recognise the signs and symptoms indicating the potential for a flashover or fire gas ignition to occur. 2.3 Conduct a dynamic risk assessment during a given compartment fire. 2.4 Predict the effects of extinguishing agents and techniques on compartment fires. 2.5 Describe the control measures used to provide protection from the effects of fire. 2.6 Understand the physiological effects of dealing with fires in compartments. 2.7 Describe the protective value and limitations of Personal Protective Equipment (PPE). 2.8 Predict the effects of ventilation on fire development. 3.1 Obtain and exchange information to support the planning and implementation of fire fighting operations. • Command and control procedures. • Gaining access to a compartment fire. • Securing egress from a compartment fire. 3.4 Experience and assess the changing conditions associated with the development of a fire in a compartment and take appropriate action (dynamic risk assessment). 3.5 Select and use the appropriate protective equipment for personal safety. 3.6 Implement measures to minimise the occurrence of a flashover or backdraught. • Gain access to a compartment fire. • Maintain egress from a compartment fire. • The adoption of appropriate and regulated door entry techniques. • The reduction of temperature by effective use of branches. • The role of external tactical ventilation. 4.3 Take the actions necessary to prevent a backdraught from occurring by adopting the correct methods of ventilation and fire suppression. Rio Tinto Fire and Rescue Department, Weipa, Australia. ● Split Front Doors assist in controlling and setting internal conditions for various traning objectives. ● Side Safety Door with Magnetic Latch facilitates safe and easy egress. An internal padlock allows security at the end of training sessions. ● Side Vent System with 3 strategically located control points to allow for reliable and easy operation. ● Particle Board Retention System designed to minimise the time and effort required for loading. ● 3 metres of fire resistant flooring. Pre drilled for drainage and covered with 40 mm clay pavers. ● Swinging Foyer Wall with inward and outward opening timber entry doors for “Attack” and “Entry” technique practice. Our highly experienced staff will supervise the commissioning to ensure that all of the systems are operating to design specifications. Temperature monitoring and Data Logging equipment can also be supplied and installed at a competitive rate. Delivery to site not included. Modifications are guaranteed free from defect for 12 months after delivery. If you want to provide your staff with the safest and most realistic training experience, then contact Aus-Rescue today for an obligation free consultation. This carbonaceous flashover simulator, has features that allow for teaching the basic "observation" exercises and "attack" evolutions. Designed by end users, built by end users, commissioned and supported by end users! This unit is now being specified by a growing number of Australian and International Fire Departments because of its versatility. Traditionally referred to as the "Window", this training cell is constructed from a 20' (6.5 metre) shipping container. The purpose is to provide a visual demonstration of the fire stages leading to flashover and backdraft. 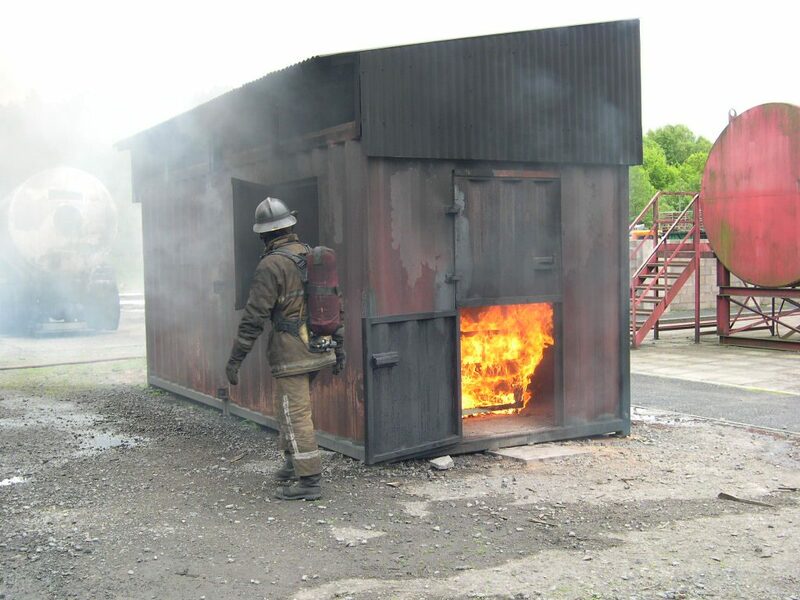 By altering the air flow via 2 stable doors and one hinged window, the instructor can provide a large scale demonstration of the fire behaviour indicators that are present before flashover and backdraft. It also provides an opportunity to demonstrate hoseline techniques that can be used reduce the likelihood or severity of these events. This demonstration is facilitated by an instructor outside of the cell who manipulates the ventilation profile to produce the desired conditions. The STUDENTS are located a safe distance from the unit in a position that allows them to safely witness the "pre-indicators" of flashover and backdraft. Because this demonstration does not require the students to enter the hazard zone, a wide range of students can benefit. This includes firefighters, fire engineers, building designers, industrial fire teams etc. • understanding the hazards and risks within the environment, and applying the appropriate tactics and observing a demonstration of the appropriate entry techniques,. In particular it offers an opportunity for learners to observe the techniques necessary to mitigate backdraught conditions. Click here to see a video clip of this type of simulator in use in Sweden. We have been involved in the design, construction, commissioning, development of safety procedures, and training of Instructors for effective and safe of a wide range of Class A and Class C training facilities.